Legacy and Longevity. Gustav's of London. The complete gentleman's gift set. A hand crafted chest with a gold plaque adorned with your personalised message complementing quintessentially timeless pieces for your loved one. With the staple of Ties, Square & and a fine bottle, tailor the contents to your wants. Be it a Breitling watch, Monte Cristo cigars or a Mont Blanc fountain pen, the gift you give will last a lifetime. A collection of fine ties and squares for all seasons presented in a handcrafted chest with a personalised plaque. This one was designed for the father of grateful bride, where each tie and square pairing were to be worn at each event across the wedding celebration. Designed, developed and commissioned for a client as a birthday gift for a Gentleman. 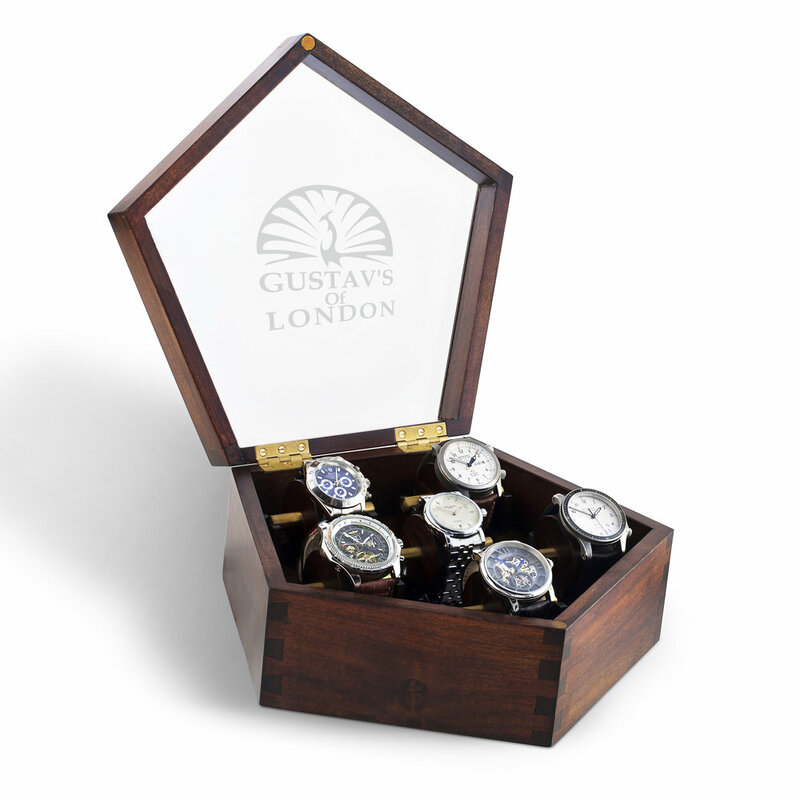 The set houses 6 luxury watches, beautifully displayed in a timeless chest. The greatest wedding gift one can offer. The set carries 2 luxury watches, designed to stand the test of time stored within a beautiful display chest, engraved and perfect to be passed down to the next generation - ensuring the happy couple's wedding day leaves a lasting legacy. We will design something completely unique for you, perfect for making sure the occasion has the reverence it deserves.